Healthy bones and immune system function, and may help support normal sleep rhythms. Vitamin D is an important nutrient for infant health, especially bone and immune system development, and may help support natural sleep rhythms. 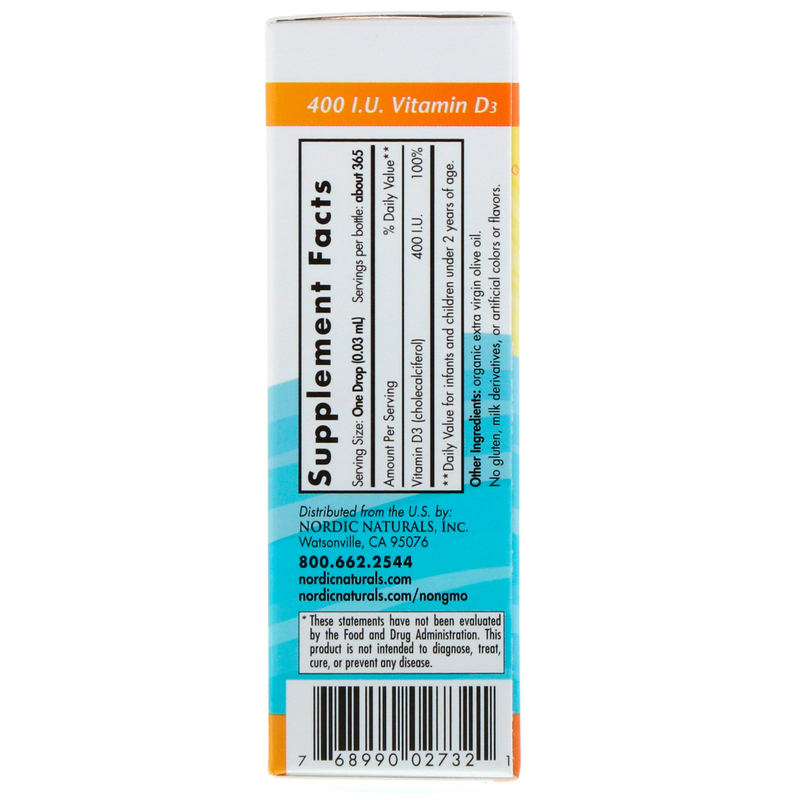 Nordic Naturals Baby's Vitamin D3 provides the recommended dose of 400 I.U. in just one drop. 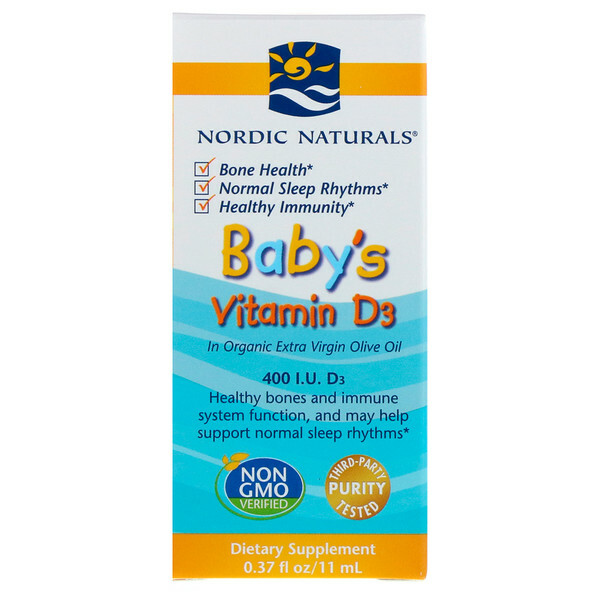 With a convenient applicator, Baby's Vitamin D3 is made with certified-organic extra virgin olive oil, and contains no coloring or flavoring, in order to ensure that your baby gets only the purest, highest-quality vitamin D.
The American Academy of Pediatric recommends that breast-fed or partially breast-fed infants receive 400 I.U. of supplemental vitamin D daily. While breast milk is the best source of nutrients for your baby, it likely won't provide sufficient vitamin D. Supplementation is the best way to avoid deficiency in infants and children. Nordic Naturals Baby's Vitamin D3 is the Official Baby's Vitamin D of the American Pregnancy Association. For infants and children, one drop daily. 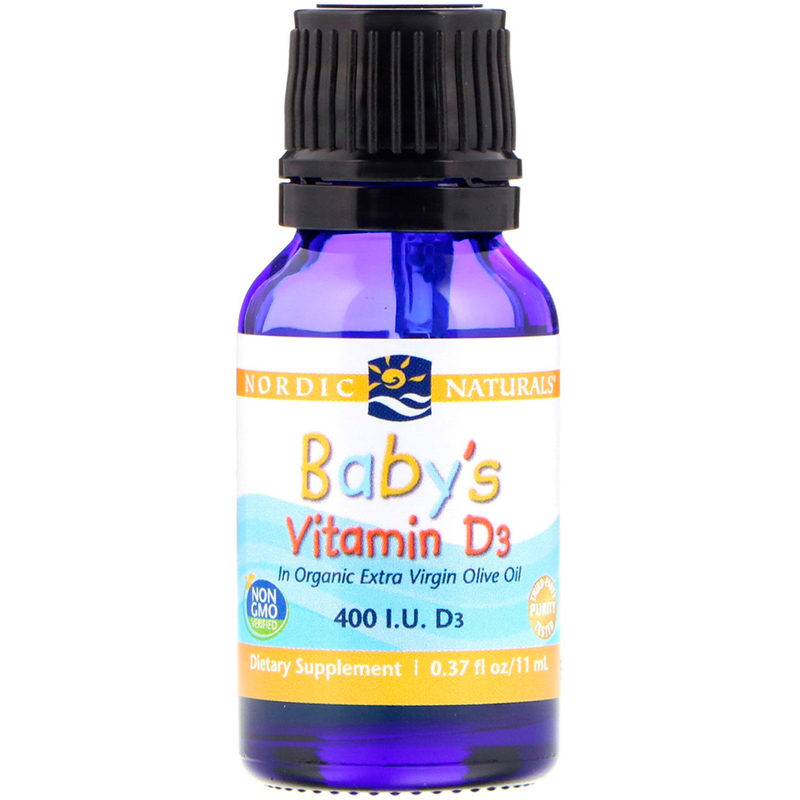 Consult with your pediatrician or healthcare professional before giving your baby vitamin D.
Directions: Never administer this product by putting dropper bottle into infant's mouth, or by dropping liquid directly into infant's mouth. For correct dosage, place one drop onto pacifier or mother's breast before nursing. Alternatively, product may be mixed into food or liquids. It can also be taken from a spoon. If air becomes trapped in the dropper mechanism, hold the bottle on a slight angle or put the cap on and gently turn it upside down a few times before use. **Daily Value for infants and children under 2 years of age.